A collaboration with novelist Peter Straub, created for the Contemporary Jewish Museum’s ongoing Havruta in Contemporary Art series. Developed out of conversations about the depiction of visual artworks in literature, especially supernatural fiction, the project evolved into an investigation of the history of Das Beben, an obscure group of 19th Century painters whose work had been virtually wiped from history by a series of calamities. 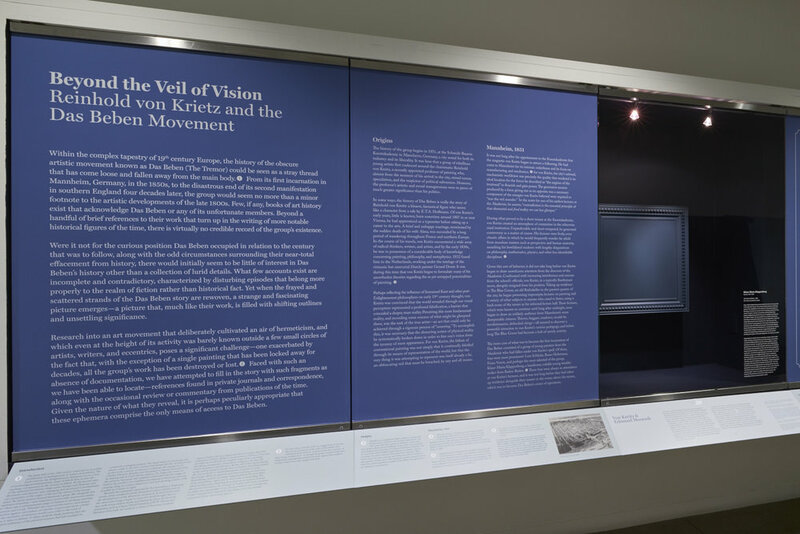 For its presentation at the CJM, the project took the form of a somewhat traditional museological display recounting the group’s troubled history and its influence on better-known artistic movements of the 1800s. Along with the text, blank “placeholder” canvases were presented to stand in for the lost paintings of Das Beben, each with an accompanying description of the work reconstructed from various historical records.